Description: Sexes similar. Wren-shaped. Sooty-gray overall; short wings and tail; yellowish feet; and a dark bill. 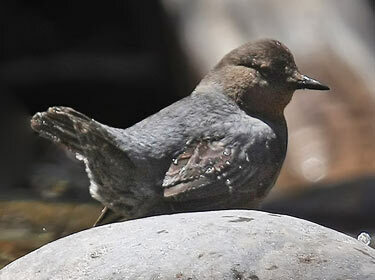 Juvenile is paler, with mottled underparts and a pale bill. 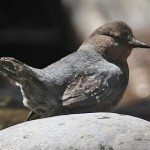 Behavior: Dippers lead an aquatic life, wading and even swimming in mountain streams to feed. These birds will run along the bottom of streams with their wings half-open. Habitat: Found near clear, rapidly flowing mountain streams in wooded areas. Where in Nebraska: Rare vagrant. Individuals have been reported once each from Sioux, Dawes, Cherry, Holt, Chase, and Adams Counties. At least four records since 1960. Nebraska Seasons: Will sometimes move to open water at lower elevations during winter.